Residing in South China for about 1,700 years, the Teochew (Chaoshan in Mandarin) people are one of three ethnic groups who have lived in these lands for generations. Though they have long shared the region with the Cantonese and Hakka, they still maintain their own language and have inherited a unique culture. 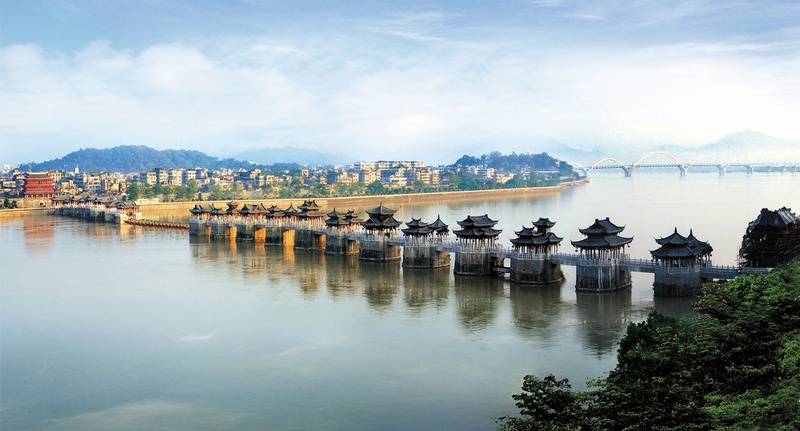 According to modern Chinese geography, the Chaoshan region generally refers to the cities of Chaozhou, Shantou, Jieyang and Shanwei, located in the southeastern part of Guangdong province. People from this area refer to each other as gaginan (Teochew transliteration), or ‘my own people’ in English. One of the foremost characteristics ascribed to the Teochew is an instinct for trade and business, no matter if it’s a neighborhood grocery store or a global corporation. Amongst a long list of well-known Teochew entrepreneurs, the most notable are Li Ka-shing, formerly the richest man in China, and Ma Huateng, founder of Tencent, the company that created the almighty WeChat and QQ. In the history of the Teochew people there were two major migrations. The first occurred from the Western Jin dynasty (A.D. 265-316) to the Tang dynasty (A.D. 618-907), when masses of Han people fled south, usually as clans, to escape the occupation of the north by nomadic groups. Some of the traditional Cantonese and Teochew families still keep documentation of their pedigree. For example, Donald Tsang, former chief executive of Hong Kong, has said that his ancestors came from Shandong province to Guangdong’s Nanhai County, and that his grandfather moved to Hong Kong from there. Considering most of them lived on or not far from the shore, it is hardly surprising that the Teochew people became brave maritime explorers. This led to the second great migration, which occurred more than 1,000 years after the first. Many Teochew began leaving China after the First Opium War via one of the four treaty ports established by Great Britain along the southern coast, primarily Canton (Guangzhou) and Swatow (Shantou). At the beginning, most left home because of famine, sailing away to earn a better living and mailing back letters along with money to feed their families. Research done by the China Science and Technology Group in 1994 revealed that the late-1800s diaspora of the Teochew means that today their descendants can be found throughout Southeast Asia, including five million in Thailand, 800,000 in Malaysia and Indonesia, 500,000 in Singapore, 300,000 in Vietnam and 200,000 in Cambodia, as well as a further 300,000 in the US, 150,000 in France and 100,000 in Canada. The Teochew people are sometimes known as the ‘Jews of the East,’ a term supposedly coined by a Thai newspaper, after King Rama VI of Thailand praised the Teochew’s “racial royalty and astuteness in financial matters.” Their spread across Southeast Asia was similar to that of the Jews in Europe, as was the resulting discrimination and prejudice that arose against them, largely due to their perceived economic clout. Teochew dialect is closely related to the Hokkien and Taiwanese language. Rather than a uniform pronunciation, there is substantial variation between different areas of Chaoshan, and between different Teochew communities overseas. The dialect is considered one of the oldest and most well-preserved Chinese languages. After the Song dynasty (A.D. 960-1279), Han culture and its speech was influenced to a large extent by northern conquerors, such as the Mongolians during the Yuan dynasty (A.D. 1271-1368) and the Manchu people during the Qing dynasty (A.D. 1644-1912). However, the spoken word in the far south has managed to keep its primitive form. As with many regional Chinese languages, however, there is a fear that Teochew will die out. Younger generations who grow up outside of the Chaoshan region tend to speak Mandarin, whereas their overseas counterparts focus more on learning the language of wherever they are living. Within a few generations, Teochew could be lost to all but those living in the Chaoshan region. The good news is that quite a few overseas Teochew associations have been established by those who want to breathe life into the culture and dialect, including the Paris-based L'Amicale des Teochew en France and the Teochew Association at the University of California. There are many ancient traditions that are still practiced today in Guangdong, especially in underdeveloped areas such as the Chaoshan region. Ancestor worship in particular is given significant importance in Teochew society, as many continue to believe that the departed can shield against danger and misfortune while bringing blessings and wealth – if they are properly honored. Led by the clan elders, descendants show reverence to the deceased in ancestral shines throughout the year, but most especially during Qingming (Tomb Sweeping) Festival. On minor dates, a few family households will bring modest offerings, whereas grand occasions call for the whole bloodline to attend, usually bearing five different animals – including an entire roasted pig and goat – as well as buckets of steamed rice and numerous cups of tea. Prior to an important ancestor worship ceremony, firecrackers are lit, followed by an emcee announcing the commencement of festivities, which is heralded by a great din of drums and suonas. People kneel down and say prayers to their expired family members. Mountains of paper money and incense are burned. After the establishment of the PRC, these traditions were discouraged, because they were considered a residual corruptive custom of feudalism. Ironically, they were sustained in Southeast Asia – in Thailand, three days before every year’s Winter Solstice (冬至), the clan of Lin has a large ancestor-worship ceremony where over 3,000 people gather. Traditional Teochew people do not consider a meal without seafood a proper meal. Mild flavors and minimal use of food oil are common traits of the cuisine, with freshness and quality of ingredients determining the taste and flavor. Poaching, braising and steaming are common techniques, and Teochew food is generally regarded as relatively healthy. A popular condiment is shacha sauce (沙茶酱), a paste made from soybean oil, garlic, chili, dried shrimp and fish. It is commonly used in beef and Chaozhou hotpot. Also common are pork, chicken, duck and tofu stewed in a mixture of anise, licorice, Sichuan pepper and cinnamon. Teochew oyster omelet is one of the most popular eats in Taiwan’s night markets, as well as in Fujian. Though it varies by region, in general the omelet is filled with oysters that have been fried with pork lard. Starch is added to the egg batter to give it a thick consistency. Great lovers of a good brew, Teochew people are noted for being partial to kung fu tea. Though it has nothing to do with martial arts, it’s certainly got some kick. A good tea set is a must-have in every Teochew home, from which any courteous host will serve guests with a kung fu cuppa. Outside the home, Chaoshan restaurants commonly serve an oolong tea called Tieguanyin in tiny cups before and after a meal, the thick, bittersweet taste apparently thought to work as both a non-alcoholic aperitif and digestive. // The Chaoshan (潮汕) region can be reached by fast train from Guangzhou South Railway Station in approximately three hours and Shenzhen North Railway Station in approximately 140 minutes. Some individuals of Yunnan's Dai minority still carry some of the ancient characteristic symbols of their heritage: black-dyed teeth and tattoos. Visit Xinjiang without the 32-hour train ride by going to Guangzhou's weekly Muslim Market on Lanpu Lu in Yuexiu. Despite being the largest ethnic minority in Guangdong and boasting a population comparable to Chicago’s, the Yao have historically remained absent from all social, economic and political interactions in the region. We decided to untangle what’s true from what’s false regarding this people and their culture.